I love tiramisu. The creamy coolness of the sweet mascarpone custard, the slight bitterness of the espresso, the softness of the ladyfinger cookies, it's just sooo good. I can't get enough of it. I love it so much that I'm willing to ignore the fact that it includes uncooked alcohol. I dislike the taste of alcohol but when added to tiramisu it serves only to enhance flavours not overpower them. My aunt's tiramisu is fantastic. I look forward to any time that she might make it. I was talking her tiramisu up with big time excitement this past Christmas and it was a no show. Apparently I frightened my aunt from bringing anymore desserts because I have a tendency to go a little overboard :). In reality it was a good call, there was so much dessert already, but I was still a tad disappointed. All my sad faces and mournful sighs made my aunt take pity on me and she promised she would make it for my birthday. Things were looking up. However it occurred to me around Easter that as much as I would love the tiramisu delivered for my birthday, I would enjoy it even more if I could make it with her. I had never made tiramisu before but more importantly, I have never really had the opportunity to spend time with my aunt outside of family gatherings. My aunt and I share a lot in common and often times after my Grandfather and uncles are done judging me (I kid :)), I spend the majority of time talking with my aunts :). So setting aside time to get together was something I was really looking forward to. I showed up at her place mid afternoon on the first Saturday of my vacation (after running a bunch of errands, including picking up my own birthday cake, thanks Mom :)) and was immediately told that I would be partaking in a snack prepared by my uncle (proving without doubt that he is my Grandmother's son). It was some type of grilled pita pizza thing. Nervously I accepted the invitation even though I was plenty full at the time. Why was I nervous? Well let's just say that one of his ingredients was simply "meatloaf." Who does that? After my uncle regaled us with his culinary skills (it was actually pretty good) my aunt and I got down to work. She couldn't remember exactly where her recipe had come from, but was pretty sure it was from one of her mother's old cookbooks. Now, because of my presence, I think my aunt was measuring out things with a little more care. But as we began the process of whipping the cream she started to question the amount of cream she had used. It seemed that there was a lot less than normal. As she looked at the whipped cream it dawned on her that perhaps she never paid attention to the amount, adding the entire carton (2 cups) in error. After spreading the custard over the first layer of ladyfingers, she was convinced that this was the case and mused that “maybe that's why it's so good." It was at this point she began to question the quality of the tiramisu we were currently making. I tried to reassure her that it would be great no matter what, but still she looked doubtful and a little disappointed. Sound familiar :)? Perhaps this is why we get along so well. Despite her reservations we pressed on and whipped, dipped, scooped and layered until the tiramisu was completed. I didn't care what my aunt said, it was a masterpiece, how could it not be? My Aunt, Uncle and I spent the remainder of the afternoon chatting and laughing. And when I finally had to go, my aunt sent me away with a nervous: “you're going to have to let me know how it is”. My answer: simply fantastic! (perhaps the only description to adequately describe tiramisu). She asked me if the missing cream would have made it better, and I don't really think it would have. It would have definitely made it more creamy, but I think it would have also diluted the flavours. The custard was so good as is, just creamy and sweet enough. The cookies had the perfect amount of espresso which was cut wonderfully by the sweetness of the cookie and the custard. Over my vacation I ate about 3/4 of the pan myself and could still have eaten more. I was in heaven. I had a great time with my aunt and I'm really looking forward to the next time we can get together. 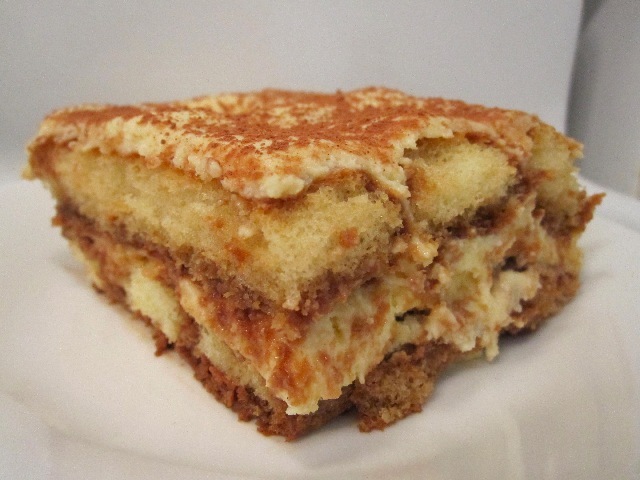 Maybe we'll have to do a side-by-side comparison of standard vs double cream tiramisu. Or maybe go way into left-field and make these fried-crab-cake-puff-ball things she made for Christmas. I still can't get over how good those were, and would use any excuse to eat them again :). My father gave me the best outro I could possibly ask for for this post. So now, without further ado, not edited in any way, I bring you: "Offering my father a piece of tiramisu". 34 Savoiardi lady fingers – my aunt says it has to be these ones, so does most of the internet. Have ready a 9x13” pan or glass dish. In the medium bowl of a stand mixer add egg whites and whip to stiff peaks. Transfer egg whites to a separate bowl and add cream to mixer bowl. Beat cream on high until stiff peaks form. Transfer whipped cream to a separate bowl. Add egg yolks and sugar to your mixer bowl and beat until pale and smooth (approx 2 to 3 minutes). Add mascarpone and beat until completely incorporated. Add cognac and 1 tbsp of espresso to the mascarpone mixture and beat until completely incorporated. Fold egg whites into mascarpone mixture until incorporated. Fold whipped cream into mascarpone mixture until incorporated. Set aside. Add cocoa powder to espresso. Dip each cookie into espresso for 1 second, flip and dip reverse side. Do not let the cookies sit for anymore time than this. Lay cookies in pan so that the long side of the cookie is parallel to the short side of the pan. Repeat until the pan is full. Evenly spread half the mascarpone mixture onto the cookies. Repeat dipping process however, lay the cookies on top of the mascarpone mixture in the opposite direction that you did the first time. Repeat until pan is full. Evenly spread the remaining mascarpone mixture on the cookies. Allow tiramisu to rest in fridge overnight. Dust with cocoa powder before serving. Looks yummy!! I liked your story about the whipped cream. I love whipped cream, but sometimes it's nice to let the other flavors take over. I'm glad you think it looks good, I was slightly worried as I wish I had a better picture. The image there is from my first piece, it was the longest time I was able to wait between slicing and eating. No other pieces I cut got the chance :). That's the problem with a fabulous dessert - no one wants to wait while you take its picture! It sounds heavenly, but I must make a confessions here. I. Have. Never. Had. Tiramisu. Lynn, you know that emoticon that's just a wide-eyed dead pan stare of shock? I'm doing that right now :).